President Trump talks with FCC Chairman Ajit Pai at the White House in November. Under Pai, the FCC repealed Obama-era net neutrality rules. A federal court is reviewing that decision in oral arguments. Obama's FCC had imposed a strict set of regulations on Internet providers to ensure they wouldn't be able to prioritize certain websites and apps over others. Trump's FCC repealed those rules, preferring a more hands-off approach that would let Internet companies charge websites for faster access to customers. Several consumer groups, technology companies and Democratic-led states challenged the FCC's decision. 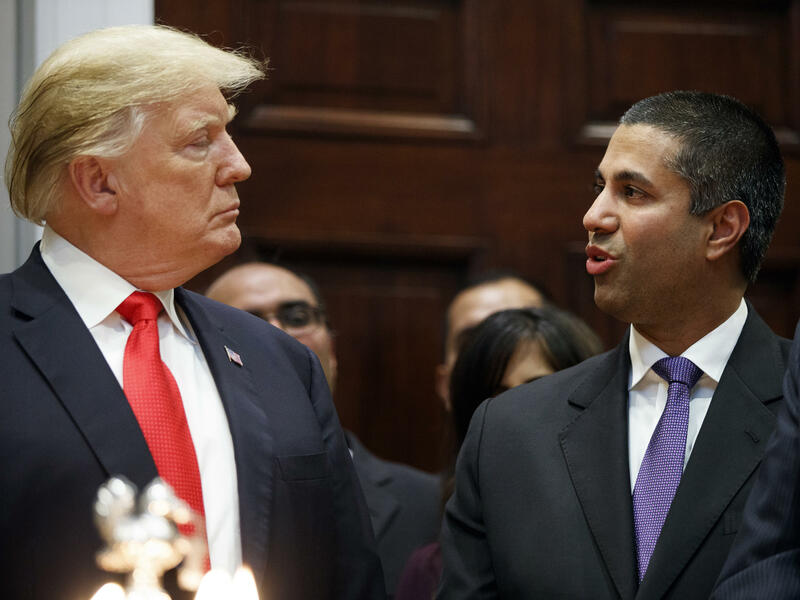 The legal arguments are highly technical, focusing on whether the FCC acted properly when it classified the Internet as a lightly regulated "information service" — as opposed to a "telecommunications service," which is subject to stringent rules. The challengers will argue that the FCC has abandoned its mandate to ensure a free and open Internet. "For a period of ten years, bookmarked by four decisions of this Court, four generations of the FCC—two Republican-, two Democrat-controlled—made rules to protect the open Internet from interference by [Internet] providers," they wrote in their court challenge. In undoing the rules, the FCC's "relentless deregulatory urge swept aside everything in its path, including the law, the facts, reasoned decisionmaking, and the decisions of this Court." The Verge calls today's challenge at the D.C. Circuit Court of Appeals "one of the most important cases in Internet law history." 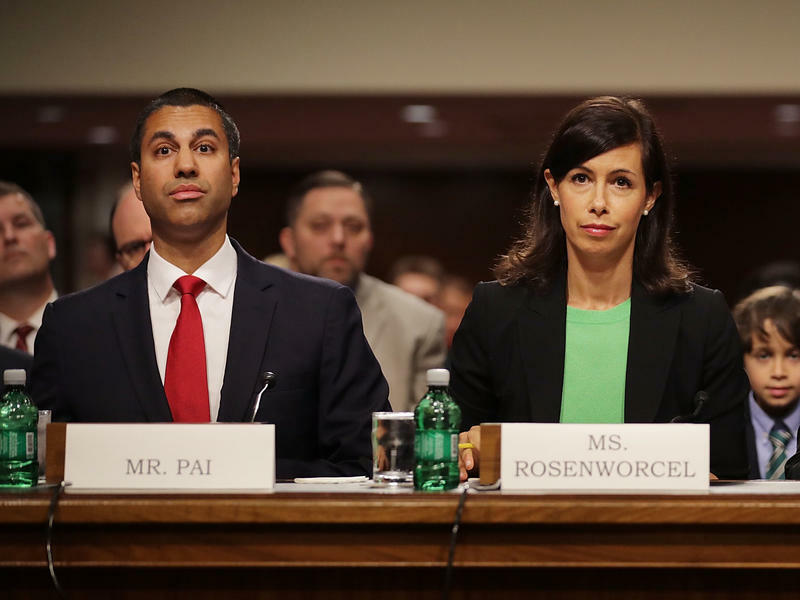 Democratic FCC Commissioner Jessica Rosenworcel says the decision to roll back net neutrality put the agency "on the wrong side of history, wrong side of the law and wrong side of the American people." More than 20 million public comments were filed with the FCC — most of them arguing against repealing the rules — though many of those were later discovered to be fake, NPR reported. NPR's legal counsel filed comments with the FCC on behalf of the public radio system, opposing repeal of the rules. In 2015, Obama's FCC passed net neutrality rules on a party-line vote of 3-2. "No one — whether government or corporate — should control free open access to the Internet," then-Chairman Tom Wheeler said at the time, NPR reported. But when Donald Trump became president, the political balance of the communications agency changed. The FCC "has officially begun to undo Obama-era regulations on Internet service providers," NPR's Alina Selyukh reported in 2017. The Republican-controlled FCC says net neutrality rules were never needed. "The Internet was not broken," Pai said, as reported by NPR. The net neutrality regulations were "like the proverbial sledgehammer being wielded against the flea. Except that here, there was no flea." Pai and other Republicans and free market proponents argued that any anti-competitive behavior by Internet providers could be dealt with by the Federal Trade Commission, using rules already in place. "The FTC will once again be able to protect Americans consistently across the Internet economy," Pai wrote. Big Internet providers, including AT&T, Verizon and Comcast, support the FCC's decision, saying "they should be able to control the pipes they built and own," the Associated Press reports. The Obama-era federal regulations known as net neutrality are done – at least for now. Though whether anything will change depends on where you live, and what internet service providers choose to do with their newfound freedom. While the Senate voted last week to bring back “net neutrality” protections, Sen. Rob Portman says he’s looking for another option. The Ohio Republican voted against the Democrat-backed bill, which is not expected to pass the House. While President Trump and the Russia investigation continue to dominate headlines, for Sen. Sherrod Brown, the top concerns on Capitol Hill this week are net neutrality, NAFTA, health care and infrastructure. The U.S. Senate passed a resolution last week aiming to reverse the 2017 decision by the FCC to deregulate internet service providers. However, experts doubt the move will be met with approval from House Republicans or President Trump. We explore the issue in the second hour of our program today. We will also look into a hacker breach of a company called Securus, which has allowed police in the U.S. to track private cell phones, and catch up on the latest in tech releases.